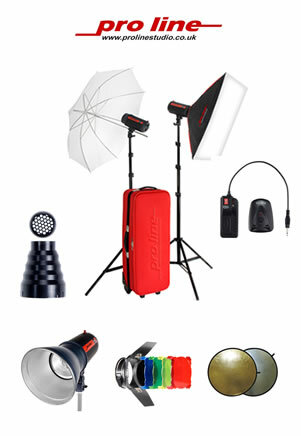 Pro Line's studio lighting equipment is recognised worldwide as the leading brand of studio equipment for both the professional and amateur photographer. The most innovative technology, coupled with high quality manufacture and ease of use puts Pro Line at the forefront for today's studio or location photographer. 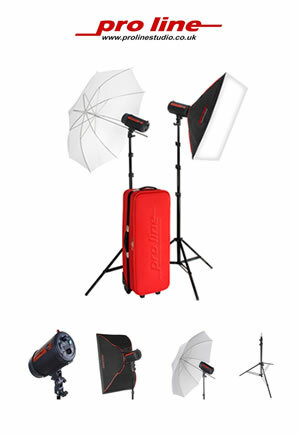 The perfect entry level 2 head kit for those new to photography it provides all of the accessories you might need as you begin to learn the secrets and pleasures of studio flash, but good enough to take your photography much further - with these kits being used in professional studios. Based around the spectacular Pro Line X-180 Apollo, this kit represents the best value available on the market. High quality, affordability, and ease of use were the mission statement when Pro Line designed these kits, and they deliver. The X-180 Apollo has a 180 w/s output with stepless variable power range from 1/8th to full. It is of solid metal construction, but with soft rubberised coating for comfortable handling and quality finish. The low 6V trigger voltage makes it safe to use with any camera. For those with a larger studio area or simply wanting more power, the 300 kits have been designed following the same principles and requirements as the design of the X-180's These lights offer all the same great features, but with the added flexibility of more output. With the simplicity of use combined with high quality and consistency, these kits are equally at home in an enthusiasts or a professional?s studio, all at a great value price. Based around the spectacular Pro Line X-300 Apollo, this kit represents exceptional value, high quality and consistency. High quality, affordability, and ease of use were the mission statement when Pro Line designed these kits, and they deliver. The X-300 Apollo has a 300 w/s output with stepless variable power range from 1/8th to full. It is of solid metal construction, but with soft rubberised coating for comfortable handling and quality finish. It is equipped with a flash slave sensor and infrared sensor so it can be triggered without a sync cord, although the low 6V trigger voltage makes it one of the safest to use if you prefer a cord (a standard cord is supplied).